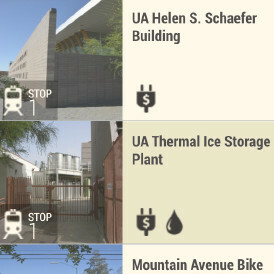 A self-guided tour of urban sustainability on UA campus and adjacent neighborhoods along a new streetcar route. 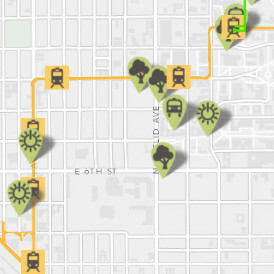 Intended to illustrate how the Tucson community has invested in sustainable outcomes through solar energy arrays, water harvesting, green infrastructure, energy efficiency and eco-friendly neighborhoods. 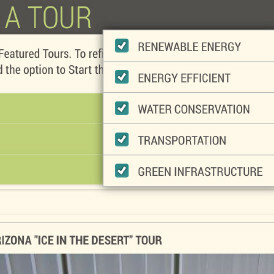 16 searchable tours of 50 sites and over 100 green features and practices. 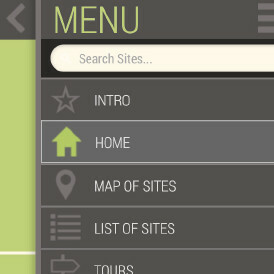 Designed to work on all smartphones and tablets (jQuery Mobile), this is a mobile-optimized Web App. The content is managed using Drupal Backend-as-a-Service, so the administrators have a clean Admin interface to make changes to the mobile site.